A year and half ago, I received an email from Nicole Calmels, a sixth-grade science teacher at my son’s middle school, asking for parent-volunteers. 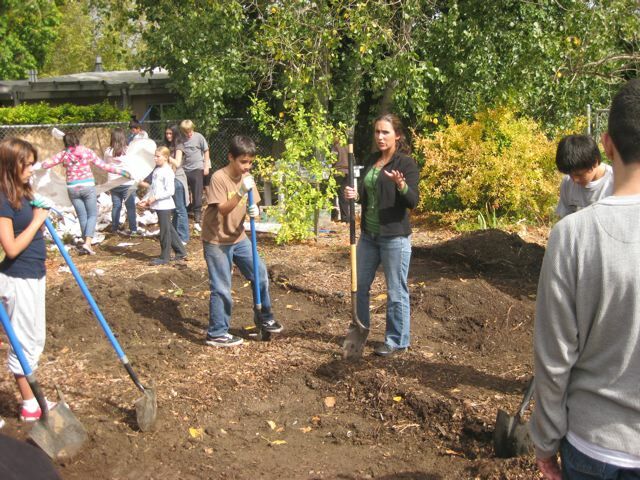 The school’s garden had been neglected for the last three years, and she wanted to resurrect it with her class. I told her I’d come by once or twice to lend some of my master gardening advice, but I wasn’t going to be hoodwinked into a long-term parent volunteer commitment. I’d been around the block. “I’m from New York. I can smell a rope-a-dope operation two zip codes away,” I told her. 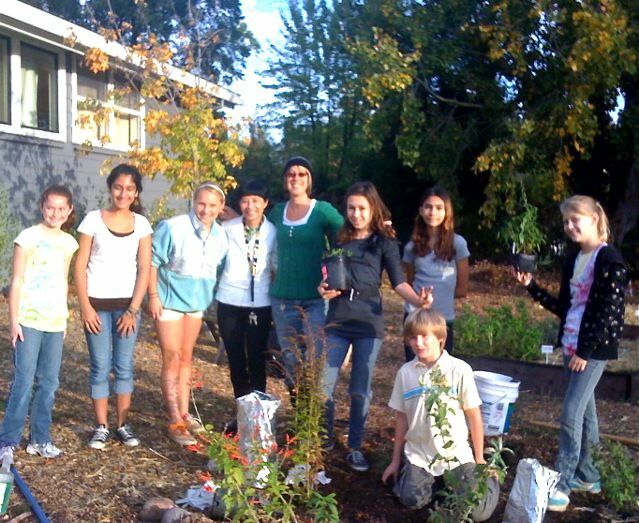 Sigh…I’ve been coordinating the school organic garden now for over a year, even during the summer months! How can you leave when an 11-year-old student says, “My experiences in the school garden have been the greatest times of my life.” You can’t leave. You’re stuck. Sucker-punched by a sixth grader…. I decided if I was going to stay, my goal would be to turn those kids into tree huggers and flower enthusiasts for life, brainwashing them just like the junk food and videogame companies aim to do. Imagine children addicted to do something good that won’t kill brain cells, clog arteries, or make them sick, obese, and lackadaisical. The Centers for Disease Control and Prevention states “the academic success of America’s youth is strongly linked with their health.” Children who eat well are more likely to perform well and have fewer behavior problems. This outdoor learning, away from sitting at a desk, encourages students to explore and problem-solve, while also building their self-esteem, nourishing their bodies and spirit, and offering them an appreciation for the gifts of the natural world. According to Dr. Michelle Ratcliffe, farm-to-school program manager for the Oregon State Department of Agriculture, “School gardens are not a fringe element anymore. 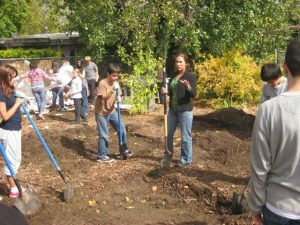 I must have received 1,000 calls this past year from people asking me to help them start a school garden or farm-to-school program.” There are now roughly 4,000 school gardens in California alone. Nicole Calmels says the garden has opened up so many opportunities for class discussion about home gardens, organic products, healthy foods, waste management, and sustainability. She witnesses the students relating their lives outside of school to the school garden, instead of her trying to draw connections between the textbook content and the rest of the world. The garden shows the students not only how food for many can be grown without harsh chemical fertilizers and pesticides, but also the various weather challenges farmers who grow our food have to endure, and where “real,” healthy food that’s not packaged, processed, or laden with salt, corn syrup, and so-called natural flavors, comes from. It comes from the SOIL. Itching to create a school garden on the weed patch at your school? Have I got news for you! Arden Bucklin-Sporer and Rachel Kathleen Pringle of the San Francisco Green Schoolyard Alliance recently published their instructive and superbly straightforward book called How to Grow a School Garden: A Complete Guide for Parents and Teachers. This is my bible on starting a school garden. It takes you step-by-step from “why school gardens” to budgeting, fund-raising, sample lessons of State Content Standards, and finally, to groundbreaking, planting, and maintaining. 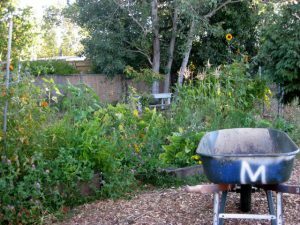 The authors write in their introduction that, “School Gardens are a collective effort; this book shows you how to maximize and sustain the energy within your community. 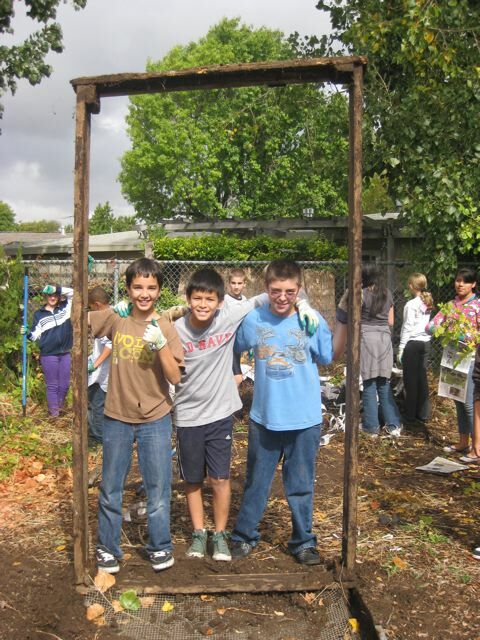 Building a school garden is a very accomplishable project. Developing strategies that sustain over time, however, is infinitely more complex.” But don’t worry, there’s a whole chapter on how to divvy up and organize the work between parents, students, and teachers to maintain not only the garden itself, but also the energy surrounding the garden. Dirt Diva Tip: If your school doesn’t have the budget for a garden coordinator, get your hands on a local master gardener like yours truly. He or she will bring in all of her other “chumps who love kids and plants” to come help out those overworked teachers, staff, and parent volunteers. To find a master gardener in your area, go to the American Horticultural Society’s website at www.AHS.org, and click on the Master Gardener link. There you’ll be able to write in your zip code, and, hopefully, find your peeps! For more on school gardens and science curricula, visit the California School Garden Network and the National Gardening Association Kids Gardening Program. I love it! We had a school garden at an elementary school in Hastings, N.Y. that I taught at in the 80’s. Started by some volunteers from Mt. Kisco and me. It was wonderful and the kids loved eating what they grew, learned about vegetables that they were not familiar with, loved gorwing and caring for their garden and was very protective of it when older kids felt like destroying or stealing from the beds. They learned about the food that they grew in the classroom as well as out of doors, and we took them exploring on the property as class outings when they got cabin fever dto learn aboutd other plants that were not edible. This sort of learning experience should be propogated at every turn. So pitch in adults, whenever, wherever, and however you can. It’s rewarding for you, the neighborhood, the school, the children and the earth.